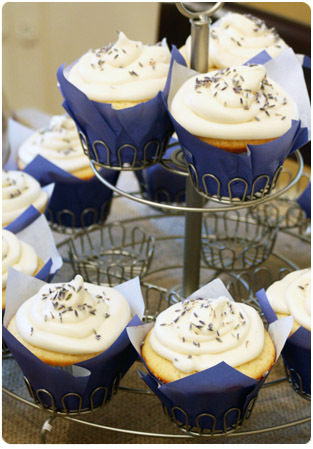 I’ve had several requests lately for the Lemon Lavender Cupcakes that I made for my sister’s recent lovebirds themed bridal shower. So today, by popular demand, I’m sharing the recipe! The cupcakes have layers of subtle, fresh flavors that work perfectly for a shower or party. Enjoy! Preheat oven to 350. Combine flours in a small bowl and set aside. In a large bowl, cream butter and sugar until fluffy. Beat in eggs one at a time and beat in vanilla and lemon zest. Juice lemons. Begin with the flours and alternately add one-third of the flours and half of the lemon juice beating well after each addition. Add final third of flour and beat well. Beat in half and half. Spoon mixture into lined muffin pans, filling each cup 3/4 full. Bake for 20-22 minutes for large cupcakes or 15-17 minutes for standard cupcakes. Let cool completely. In a small sauce pan, combine sugar and water and bring to a simmer until sugar is dissolved. Add lavender and simmer on low heat for 3 minutes. Strain liquid into a small bowl to remove lavender and let cool completely. In a large bowl, beat together butter and cream cheese until well combined. Beat in vanilla and 2 Tbsp simple syrup. Beat in powdered sugar, one cup at a time until mixture is moderately sweet. Add 1-2 more Tbsp simple syrup. Beat in additional powdered sugar if mixture is not sweet enough or half and half to get a creamier consistency. To thicken, add more powdered sugar or a few Tbsp flour and beat well. Lavender flavor will be subtle. 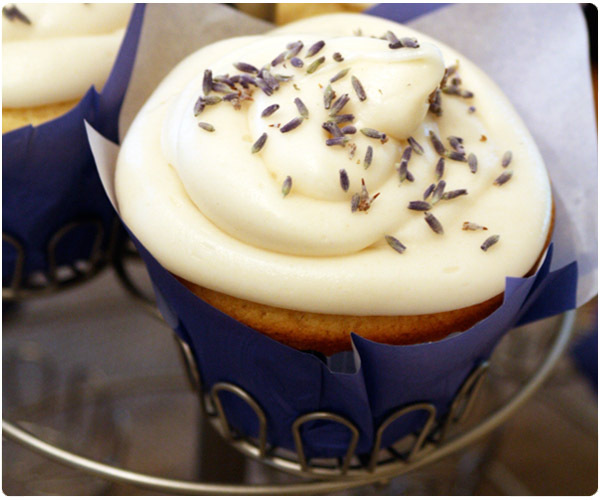 Frost cupcakes and sprinkle with dried lavender flowers. These look so beautiful and delicious! I’ve never worked with lavender before, but now I am inspired! Where do you buy lavender? Just made these tonight- deeeeeelish!! Thanks for the great recipe! About how many cupcakes does this recipe yield? Do you remember where you got the cupcake sleeves? I love them and am looking for something similar for my wedding! @marinnabw – I’m pretty sure I got them at Michael’s craft store. At that point in time they had a variety of colors and there are probably even better options now. You could also check Amazon or Etsy. Good luck!